Today was no ordinary day. As someone who works from home, and travels quite a bit outside of Australia, it is refreshing to be in a workshop with other Australian educators and learning more about their challenges and successes and needs. Being a Melbourne girl from way back I am also excited to hear more about the Queensland system - especially pockets of excellent. Today was no ordinary workshop. Organised by AITSL and their Learning Frontiers initiative a small group of us gathered at St Aiden's School just south west of Brisbane. Come from Ocean Shores it took me nearly 3 hours to get there via car and train - but I am always up for an adventure! The workshop was co-led by David Price, OBE from the Engaged Learning and Summer Howarth. David has a new book, which I purchased as a kindle version last night, called "Open: How we'll work live and learn in the future". The aim of the workshop was to work in teams and determine design principles and match them with learning practices for the new HUBS of learning being created now. Four principles of engagement were the focus: personal, connected, co-created, integrated. Needless to say we had energized discussions, and although experienced educators we all found it challenging to come up with a set of principles that were unique and that no other school could say they were already doing them all. Our team chose 'authentic learning' and 'global collaboration' as well as 'community partners'. I did not take a pic of our writing, but I believe it is being shared via the AITSL website soon. We then worked on what our version of a learning HUB would look like. This could include schools as well as extended community people and organisations. Learning Frontiers aim to put together these learning hubs for next year and are currently working through logistics of what this will look like, including leadership and management structures and breadth of stakeholders. We decided the online community was the real core of the HUB, and that through this everyone could and in fact must be connected to everyone else. We also thought that students should be part of this structure as active leaders and have a voice in the community. I see this as a real opportunity to do something different in education in Australia. It is important for stakeholders in the learning process talk to each other. Technology can provide the conduit for this. However, after more than 10 years of building online communities I know that creating a virtual hub to support the physical hub will mean a lot of work to monitor, cajole contributions and develop a community of practice. 'Build it and they will come' is not guaranteed. The 90, 9, 1 principle applies here - 90% will lurk or not even join in most cases, 9% will be reasonably active and 1% will be very active and drive the community. What is needed is experienced online teachers and community builders to help build and monitor the online community. This task will be made doubly hard by the inclusion of community members who may or may not be familiar with online learning and responsibilities of belonging to a community. Not impossible, just challenging. I do see this online community as the core of the learning HUB. There is no other way to do it. It must be transparent, open to the world and freely share ideas, plans, actions, successes and more. Yes! I said 'open to the world'. Enough hiding behind a wall - what are we hiding from? Best practice in learning must be shared to the world. The learning hub could be monitored for membership and of course moderated membership is always needed to avoid spammers, but I would suggest the idea is also to let outside interested learners in as well to further proliferate the diversity of the community. One aspect of today was the general lack of 'global' thinking. Discussion was very localised and pertinent to individual school situations. Wonderful stories were shared about engagement in learning, however to me one of the key engaging factors in the schools and with the teachers and students I work with is the fact they are taking their learning global, they are building rich collaborative curriculum and embedding interactions that support cultural understanding and global mindedness across grade levels. This is something I believe these learning HUBS could be working towards - as they build their community and develop good practices based on the design and engagement principles. Creating the conditions for change is challenging but necessary. Preparing schools for change in terms of leadership, learning and pedagogy, school structure (timetable, disciplines, curricula and co-curricula), and technology infusion is even more challenging today with the connected, mobile and ubiquitous generation coming through. We need to make schools relevant, provide more diverse personalized learning choices and connect learners locally as well as globally. I know teachers in Australia are ready for this....well the colleagues at the workshop today certainly are - so the next step is to get out of the way of the learning and make this happen! Forge new Learning Frontiers! Julie, pleasure to read this post. 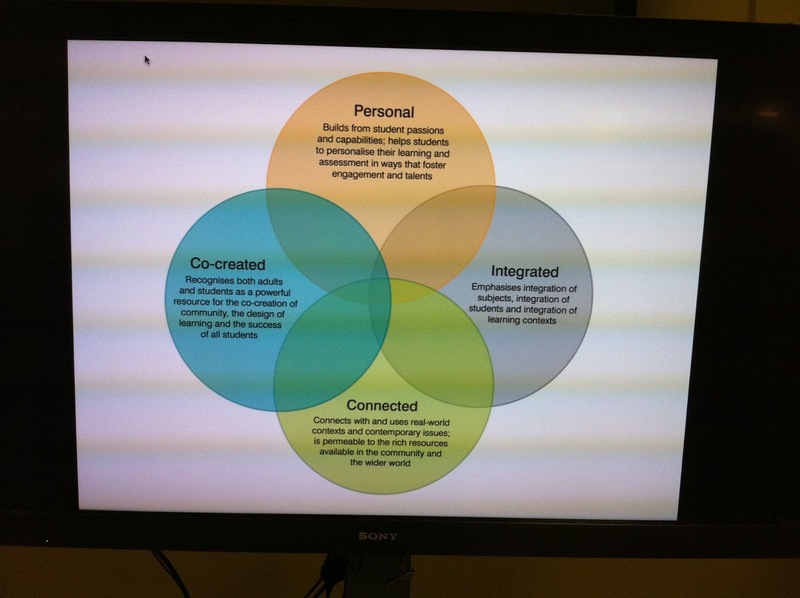 As an educator, life-long learner, and community volunteer, I believe the slide showing Personal, Connected, Integrated, and Co-created best sums up what we need to make classrooms creative labs for learning.